A sun umbrella provides a comfortable spot to enjoy a cool beverage on a hot summer day. Sitting in the shade provided by a sun umbrella allows you to sip a cool, tall one while staying protected from the killer sun's UV rays emanating from above. Sitting in the shade under a sun-umbrella is a great way to enjoy a relaxing day poolside or by the beach. But, it is always important to research your choice of sun-umbrellas making sure to choose one with the necessary level of UV protection that will keep you safe. Sure, one session exposed to the sun will not damage your skin. But, if you are an avid outdoor lover, years of exposure to the damaging sun rays may lead to developing Malignant Melanoma Skin Cancer. This is why it is very important to choose a sun-umbrella that provides proper UV protection. 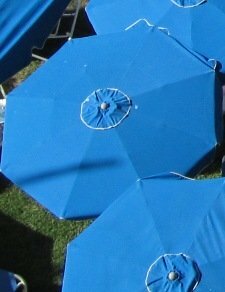 What's the Best Way to Find Sun Umbrellas? Choose a sun-umbrella that provides UV protection of 30 or above. Protection factors in from 2 to 11 are not sufficient enough to protect you. However the factor of 30 or above will provide you with adequate protection. 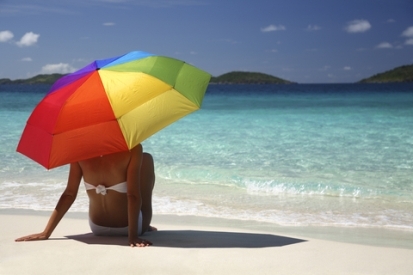 It is a good idea to look during the off-season for sun-umbrellas since they can be sold at discounted rates. Anyone looking to save money should start their search during the off-season when retailers and distributors are looking to unload last year's models before the start of the coming season. Keep in mind that if you're looking for a sun-umbrella that is going to last a considerable length of time, be prepared to make an investment focusing on the high-quality materials needed to produce an effective sun-umbrella. 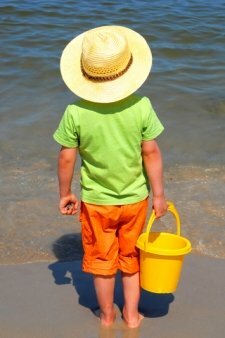 Other factors to consider are finding a sun-umbrella that has a carrying case, since folded up and closed in the case makes it much more comfortable to carry about going to the beach or other outdoor activities. Try to find a sun-umbrella that has a tilting pole. This particular feature will make it much more enjoyable and flexible in use. Keep in mind that when you're using your portable sun-umbrella it is important to make sure you have a heavy enough anchor to keep it from being blown away while you are sitting in the shade. • Do not buy large umbrellas if you plan on carting one to the beach or other outdoor activities. Large umbrellas cannot be easily moved and may also be quite cumbersome when trying to transport and could get damaged. • Purchase Sun umbrellas with colors that match your personality. • Remember to always make sure the level of UV protection that your sun umbrella choice will provide. Make sure you research the fabric that is used in its manufacture to make sure that it has spf rating of at least 30 in order to provide you with the proper sun protection you need. • Make sure your sun umbrella has a pole that can be stopped directly into beach sand. Simply click here to go to Sun Protection Umbrella Stories and Reviews.